This boomerang tends to be a low flier but sometimes does rise up in high flight depending on the wind conditions. This style flies for long distances, thus you need a lot of room. As with the Kamikaze, throwers should be more skilled to avoid damaging the boomerang or bystanders! 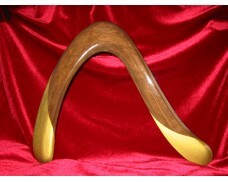 This boomerang is very interesting to watch because of the shape and pattern. It is also much easier to catch compared with the Kamikaze. 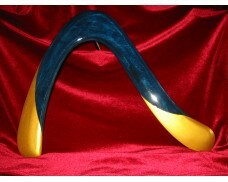 Superfly Boomerang - Lapis Blue and Gold. 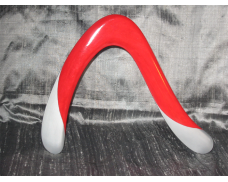 This boomerang tends to be a low flier but sometimes..
Superfly Boomerang - White and Silver. This boomerang tends to be a low flier but sometimes does ris..
Superfly Boomerang - Light Brown and Gold. 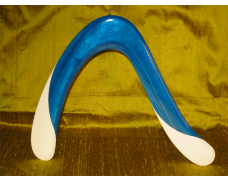 This boomerang tends to be a low flier but sometimes does..
Superfly Boomerang - Lapis Blue and White. 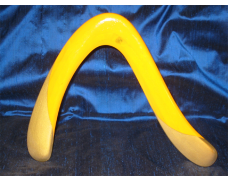 This boomerang tends to be a low flier but sometimes does..
Superfly Boomerang - Yellow and Gold. 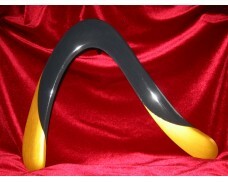 This boomerang tends to be a low flier but sometimes does rise..
Superfly Boomerang - Black and Gold. 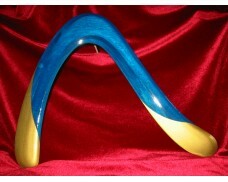 This boomerang tends to be a low flier but sometimes does rise ..
Superfly Boomerang - Indigo Blue and Gold. 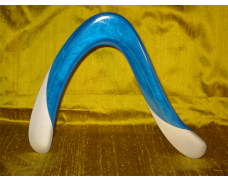 This boomerang tends to be a low flier but sometimes does..
Superfly Boomerang - Lapis Blue and Silver. 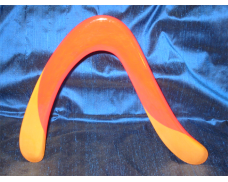 This boomerang tends to be a low flier but sometimes doe..
Superfly Boomerang - Orange and Gold. This boomerang tends to be a low flier but sometimes does rise..